Sign up for our newsletter to make sure you don't miss any important updates or events from The Aesthetic Sense. * We hate spam. Your information will never be used for any other purpose. B’shalom – With Peace. Karla perfectly captures the sentiment in this delightful piece – the dove of peace with the olive branch in its beak. 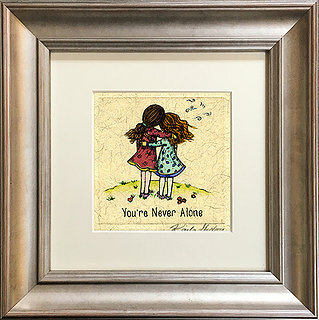 Karla’s hand painted engravings are whimsical, humorous and joyful. She lovingly depicts scenes of family, community and nature, using bright colors and exquisite and symbolic detail to bring her work to life, and evoking a familiar sense of shared human experiences and common bonds. Karla incises the outline for each of her original designs into a metal plate. She then inks and wipes the plate so that only the black lines appear on paper when the print is pulled through the press. For each individual image in the limited edition, Karla repeats the intaglio process. Karla then paints each work of art in lush, rich watercolor hues, thus achieving one-of-a-kind status for each piece. By combining printmaking and painting, Karla creates joyous images that resonate with life affirming spirit. Upon buying a printing press, Karla developed her distinctive approach to the age-old technique of hand colored engraving. Karla’s current body of work is influenced by illuminated manuscripts and folk art and thematically portrays the most meaningful elements of her life: family, culture, strong women, an open-minded worldview, and the natural world. Brick & Mortar No More! To schedule an appt, please email us at [email protected] or call during regular business hours. A community of lovers, collectors, and users of the finest and most unique Judaica, Israeli, American and global crafts. Ethically sourced artisanal and handmade goods for the soul that reflect your individual spirituality and become your source of inspiration, joy, and reflection.